Ford has offered factory installed "Upfitter Switches" in their Superduty trucks since 2005. They are useful for installing aftermarked lights, winches, power inverters, PTO equipment, and many other creative uses. 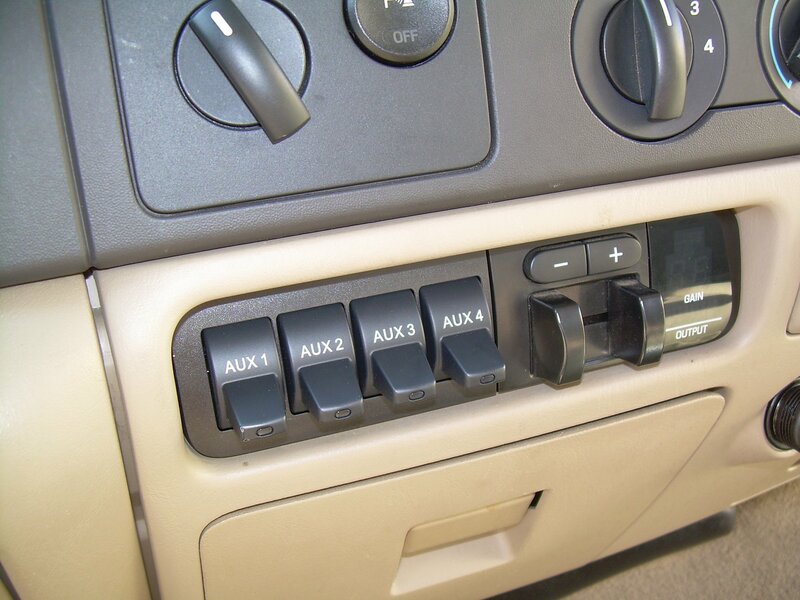 The switches are optional, so many trucks do not have them from the factory. But for about $100, it is easy to install the Ford OEM option in your own truck. The photographs here will cover model years 2005-2007. The parts required are 1) a wiring harness with relay box, and 2) the upfitter switch array (called "SWITCHES" in the photo at left. 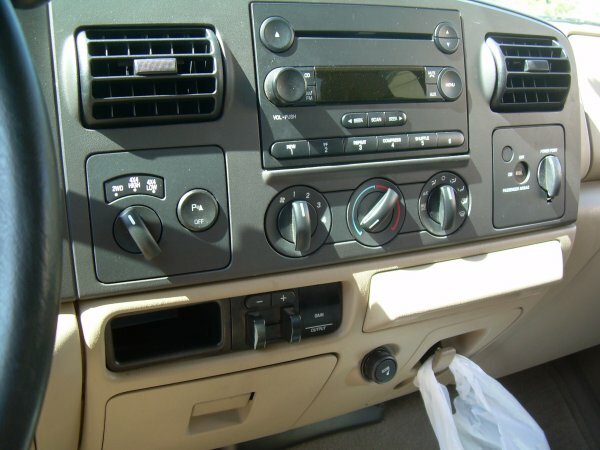 If you don't have the factory trailer brake controller, you will also need a half size cubby hole for the right side of the hole in your dash. If you have the factory brake controller, the right side of the cubby is already occupied by the brake controller. 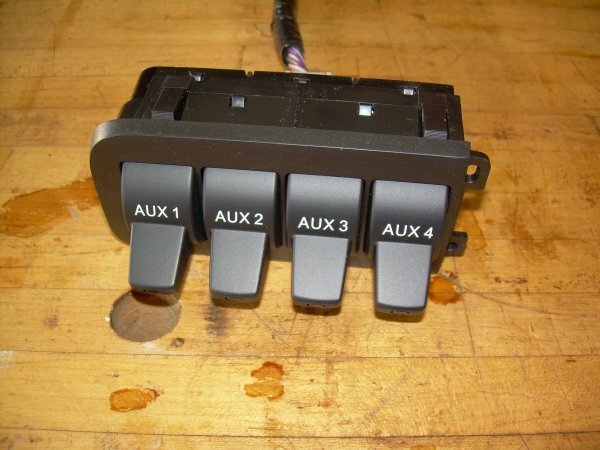 These parts are available in kit form from many online sources, or you can visit your local Ford parts department and probably pay too much for the convenience. You will also need two 10-32 x 3/4" long screws. Hex heads work well if you can find them. Here is a closeup of the relay box and attached mounting bracket. This box is going to mount above the passenger side large glove compartment with the harness leading toward the drivers side. There will be a perfect mounting location already present in your truck. The label on the box will end up facing downward once it is mounted. Here is a closeup of the switch array. Notice there are no user accessible wires on the switches themselves. 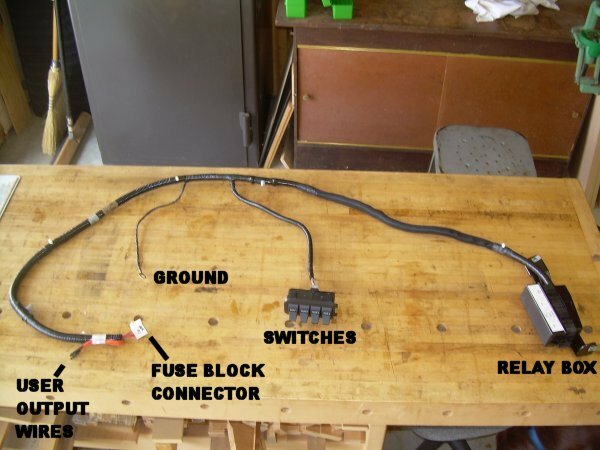 All your output wiring will be done behind the fuse block (we'll cover that below.) This switch array will snap into the hole in your dash left when we remove the cubby hole. 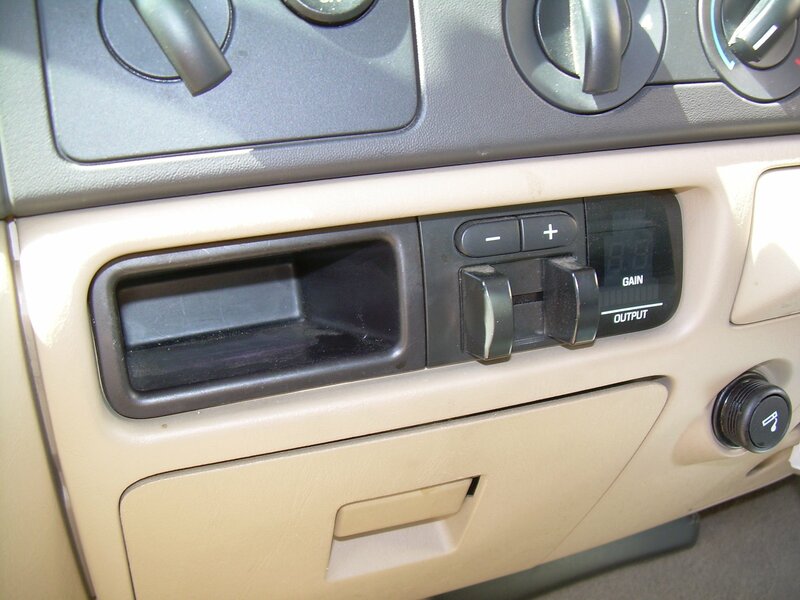 Here is a shot of my dash before the retro-fit of the switches. Note my factory trailer brake controller (TBC), and the half size cubby hole to its left side. And here is a closeup, just so we have our orientation crystal clear. Note the driver side small glove compartment directly below the cubby/TBC. Much of our work will be done through that opening. Now lets get started. Begin by lowering your drivers side glove compartment all the way down. This is done by pinching the top of the compartment together so that the two little rubber bumpers can pass through the opening. Then just let it swing down. You can remove it if you want, but it is not really necessary. Then pull your brake controller out. It just slides out, and is only held in place by friction. Reach a hand in from below to push from behind it. You may need to reach above it to push down on a spring-loaded ramp to get it moving. There are no fasteners, it just slides out. Note that the TBC needs to come out before the cubby can come out. 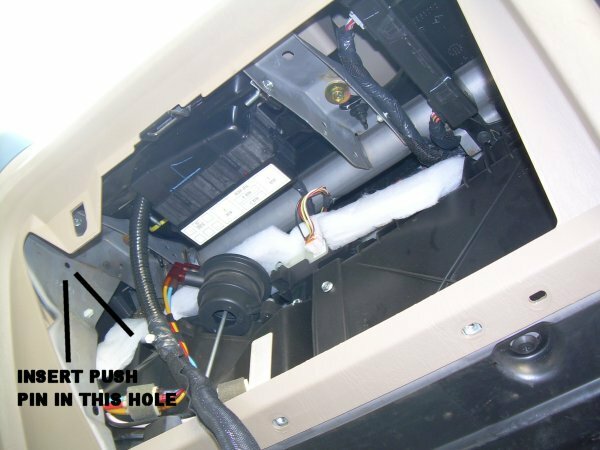 Then remove the small plastic cubby hole by pinching it top to bottom and pulling out. It may be stubborn and you'll need to pinch hard. If you don't have the TBC, you'll just have a double wide cubby hole and it will come out in the same manner. 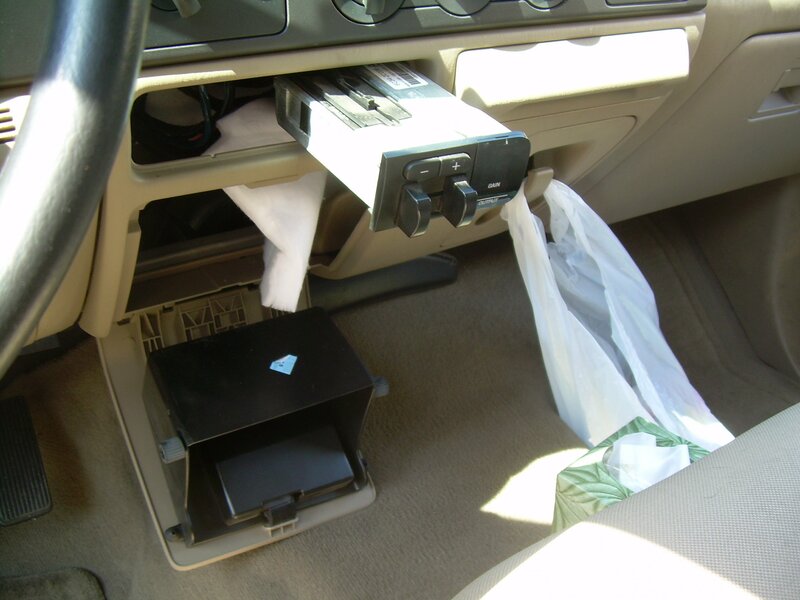 Now we will open the passenger side large glove compartment. It swings out just like the small one, by pinching the top together so the rubber bumper stops can pass through the opening. For this side I found it was a good idea to completely remove the lid so that I could lay on the floor of the truck to work. You can see one of the 3 screws that are to be removed along the hinge of the lid in the photo at left. While we are opening things up, remove the fuse panel access cover which is below the steering wheel on the drivers side. You'll find a photo of this a bit further down the page. 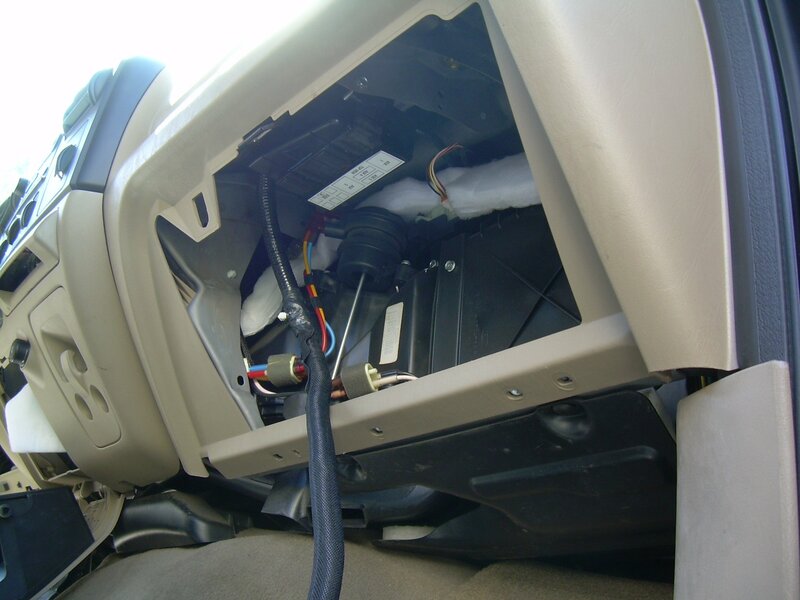 Here is a closeup view looking up into the passenger side large glove compartment box. 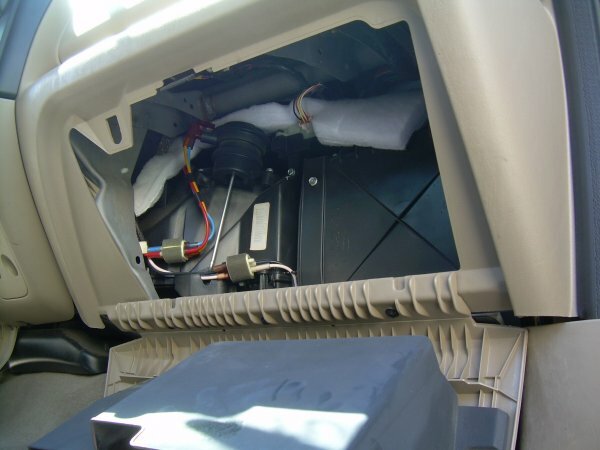 This is looking at the bottom side of the dash, in the passenger side air bag area, and this is where our relay box must mount. The holes needed are already provided, although you cannot tell which ones at this point. Here is the same view, but now I have the relay box mounted in position. It is mounted with two 10-32 screws, with the cable heading toward the drivers side. Just leave the cable hanging down while you mount the relay box. Bend the cable in a loop, and insert the first push pin into the hole shown in the photo above. Then fish the cable toward the drivers side. Try to find the appropriate holes for the remaining push pins as you go, but to be honest I'm sure I did not get them all correct. 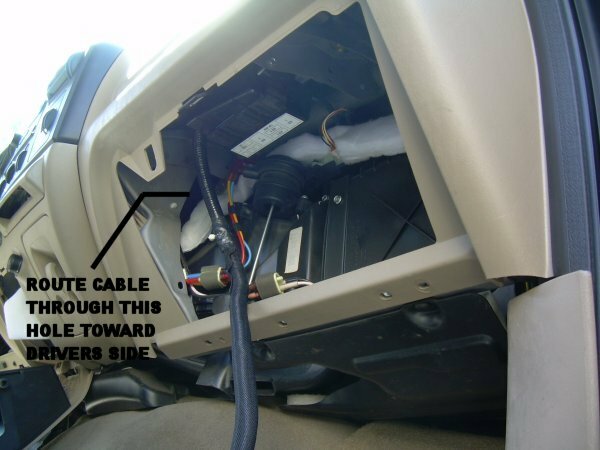 Just be sure that the cable is secure and that it won't interfere with your cup holder side, heater controls, etc. I found it helpful to remove the trash bag holder clip to better see what I was doing. Just two screws are removed and the clip comes right out. Fish the switch connector cable out through the hole where the switches will mount, and the rest of the cable will hang out of the fuse panel access cover under the steering wheel. Oops, I forgot to cover that - we'll get to it next. This completes our work on the passenger side, and now we have to work from the drivers side. 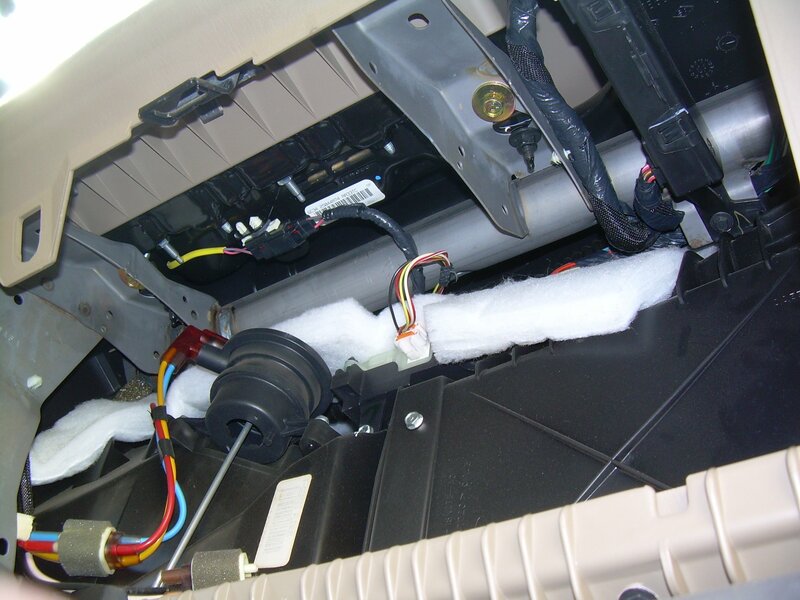 You can replace the passenger side large glove compartment lid at this time. We're done on this side. 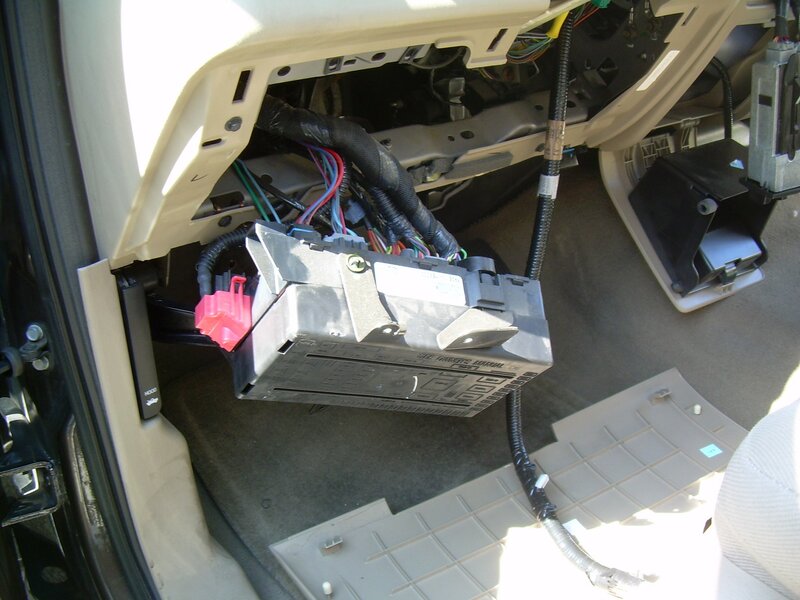 On the drivers side, we should have already removed the passenger compartment fuse panel access cover. I briefly mentioned it above. The panel just pulls out at the top and hinges down, then pulls completely off. It is laying on the floor of the truck in this photo. There are 3 plastic clips at the top, so be careful not to lose them. With the cover removed, there is plenty of space to fish the end of the cable out and let it hang as shown in the photo at left. Next, remove 4 bolts from the fuse block, and let it hang loose as well, also as shown in this photo. On the right side of the opening, attach the harness ground using one of the existing ground bolts. A good ground is essential, so make sure it is tight. Then insert a push pin retainer as shown at left. The cable loop is sticking out of the opening here, but it will push back easily behind the opening when we button it up later. 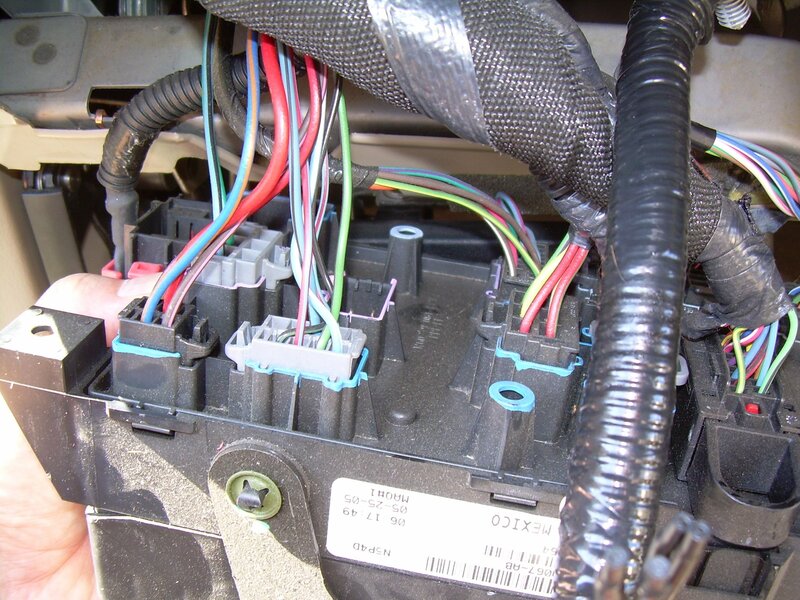 On the back side of the fuse block you will find the empty socket for the upfitter harness connection to the trucks power. 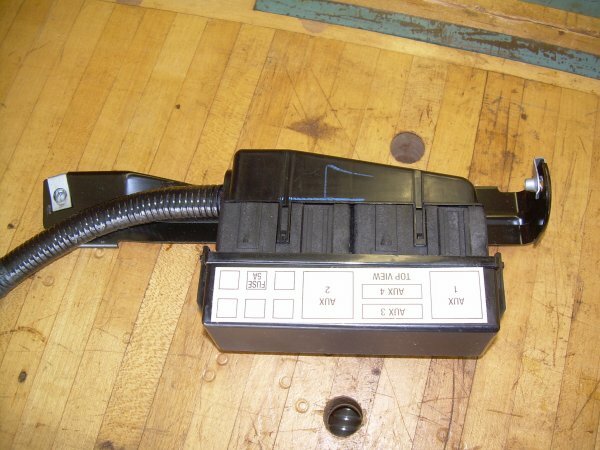 Insert the connector - it will only fit in one place, and it's keyed so you cannot get it wrong..
At this point you can bolt the fuse block back in place. But before we do, lets take a look at some details that will be required to actually use the upfitter switches. 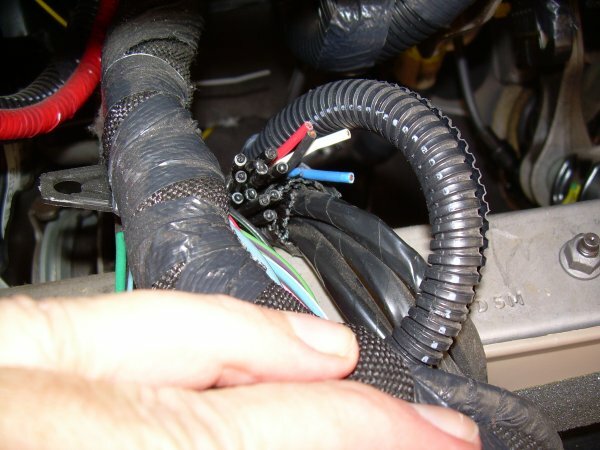 There are four flying leads (Ford calls them "Blunt Cut Wires" coming out of the connector which we attached in the previous step. Each of these wires is the output lead from the switches. The harness has a label which tells you which wire is for each switch. My thumb is covering the label in this photo. These are the wires to which you will connect whatever accessories you wish to control with the switches. In the same area, behind the fuse block, you will find four bare cut wires. They should be Black, Blue, Red, and White. 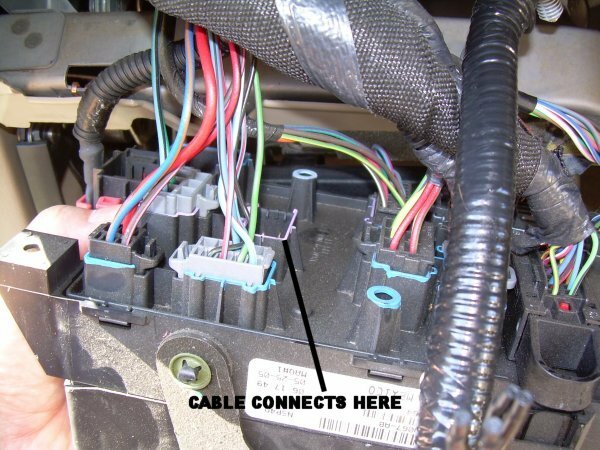 If you open the engine compartment of your truck, you should find these same wires on the firewall, above the brake master cylinder, also with bare cut ends. 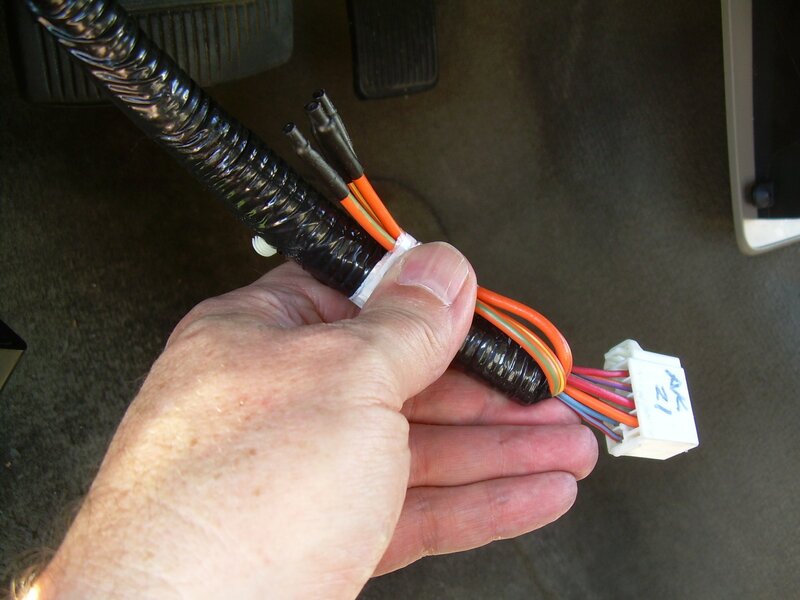 Ford has provided these wires for you to use any way you wish, and they already penetrate the cab firewall, so they've made it really easy for us. 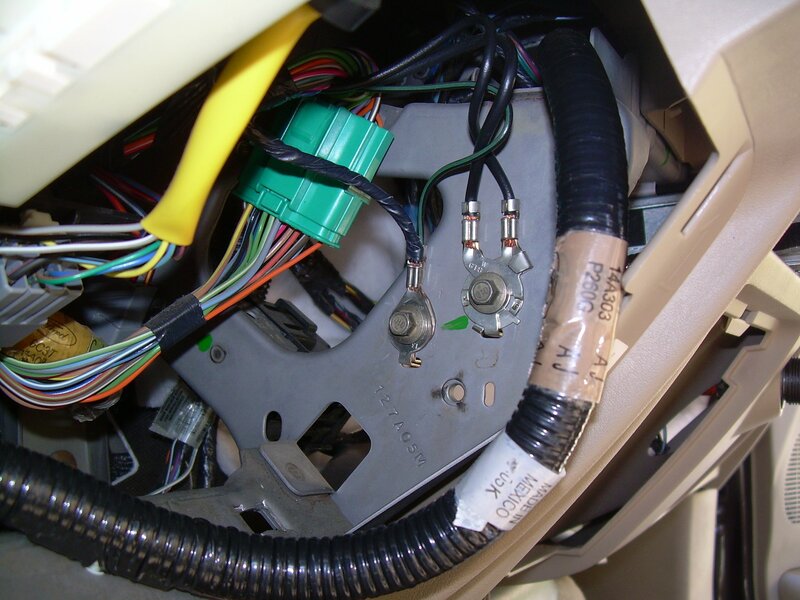 You can connect any one of these wires to an upfitter switch, and then connect your accessory to the other end of the wire in the engine compartment. 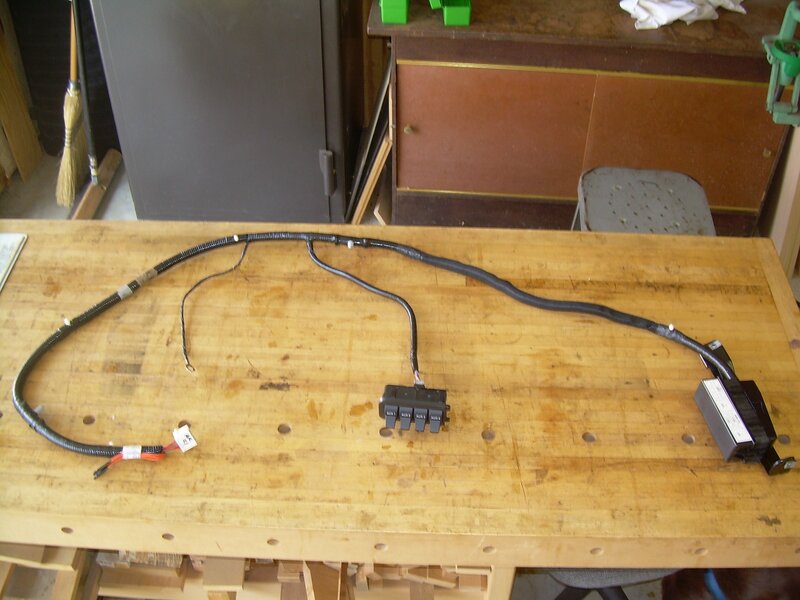 Also contained in this bundle are leads which can be used to control functions built into your truck, such as Battery Charge Protect or PTO RPM control. I won't go into the details of how to use those functions, but at least you now know where to look for the wires. All that's left now is to button it all up. The switches are the last thing to connect. Just plug them into the harness that we left hanging out through the hole. Then the switch array pushes straight into the hole and snaps in place. Lastly push the TBC into place, or if you don't have a TBC then push the new half cubby into place. Replace all the trim components and we are done! Each switch has an LED indicator in the end of the stalk. It will light up whenever the switch is turned ON, whether there is actually anything connected to it or not.